Shedding pounds means following a simple sounding formula; eat less and exercise more. If you are giving your best effort and still not seeing results you may be making a few common mistakes. 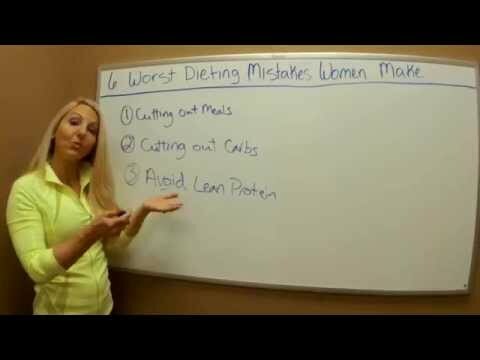 Here are the six worst dieting mistakes women make. 1- Cutting out meals. When going long stretches between meals we are going to crave higher calorie foods because we aren’t eating very often. Eating smaller meals, more frequently allows us to better control what we eat. Cutting out meals is counterproductive to our goals. 2- Cutting out carbs. To decrease body fat and get into shape we want to get the right carbs at every meal in the right balance. 3- Avoiding lean protein. Lean proteins include things like grilled chicken, eggs, cottage cheese, greek yogurt, and protein shakes. I recommend eating a lean protein at every meal. Combining a lean protein and a healthy carb at every meal is going to keep our energy level up and burn fat. 4- Eating salads. Salads can be high in calories because of all of the things we put in them. A lot of times one of the things that are missing from our salads is lean protein. 5- Eating with no awareness. Often, we don’t realize what we are eating because we wait too long to between meals and we eat what is readily available without thinking about what we are putting into our bodies. When we become more aware of what we are eating we begin to drop pounds. A food diary is a good idea to keep track of what you are eating. 6- No plan/No prep. Not planning ahead leads to impulsive choices that are usually higher in calories and fat. Take a day of the week to plan ahead and prep your healthy foods so that its grab and go. If you can avoid these 6 things you will be well on your way to amazing results. 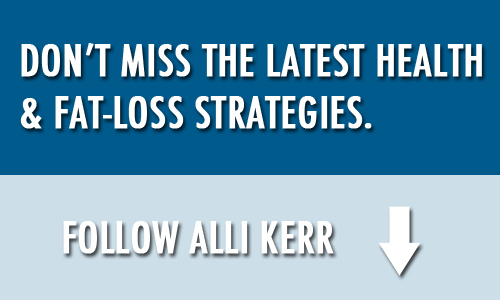 Be the first to comment on "Six Worst Dieting Mistakes Women Make"